Columbus is the largest city and the state capital of Ohio. If you have ever traveled across country, you may have passed through this city in the Midwest. On your journey through the city, you probably noticed Columbus’ love for their Buckeyes. Columbus is much more than a place for sports fans, though. If you have a love for art, music, theater, and good food, then you will feel right at home. Families, business professionals, and college students are also drawn to the area for its low cost of living, booming workforce, and higher education opportunities. Living in the city definitely has its perks. From weekend festivals to outdoor concerts, you will always be entertained. If you have decided that Columbus is the city for you, the only thing left to do is to figure out how you are going to get all your belongings, including your car, to your new home. National Dispatch can help relieve some of your moving day stress with our car shipping services. Hiring a professional auto transport company is fast, safe, and easy. Learn more about Ohio Car Shipping. After choosing to ship your car, you must decide on the auto transport services that best suit your needs. Here are a list of some of the car shipping services that National Dispatch offers. Open auto transport is the most popular way to transport a vehicle. It is probably what your mind goes to when you think of a transport carrier. These carriers can hold up to ten cars at one time. The main difference between these carriers and enclosed carriers is the fact that the car will be exposed to elements, such as dirt, dust, wind, rain, snow, and ice. Enclosed auto transport is more expensive than open auto transport because of the type of carrier used. With enclosed car shipping, the vehicle will be loaded onto a fully enclosed trailer. This provides added protection from the weather and road elements previously mentioned. Door-to-door auto shipping provides faster shipping times and added convenience. You do not have to worry about picking up or dropping your car off at a terminal. Instead, the driver will come directly to you. With our three shipping options, you are sure to find one that fits your schedule. If you need your car shipped right away, our guaranteed delivery option is the way to go. It may be more expensive, but it is well-worth the added convenience. 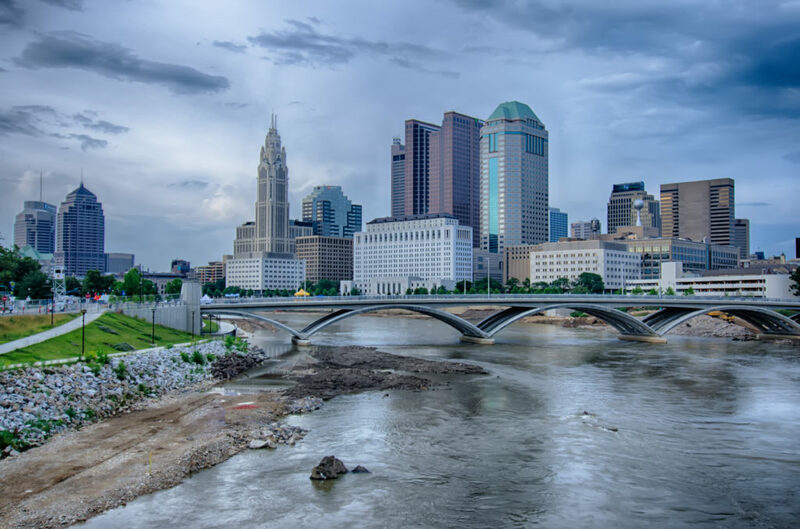 Columbus has a lot to offer its residents and visitors, alike. There’s not a lot to complain about. From the food to the culture to the people, it is all great. Before moving to the area, here are a few things that you might want to know. What’s the weather like in Columbus, Ohio? You will find summers to be hot and humid with temperatures in the 80s. Winters can be quite frigid with temperatures reaching into the negatives. Snow is not uncommon, especially from December to March. However, the city doesn’t stop with the chill of winter. Go sledding, ice-skating, or visit the local zoo (half-price admission). As we mentioned before, Columbus has a prosperous job market. There are opportunities for employment in a variety of industries, such as finance, healthcare, insurance, and more. Many large companies have headquarters located in the city. With thousands of companies in the area and an unemployment rate below the national average, the odds are on your side. In comparison to other large cities, Columbus has a low cost of living. This means that there are affordable housing options that won’t break the bank. Furthermore, you may even find that other household goods cost less, depending on where you are moving from. Columbus is a foodie’s paradise. Not only are there a ton of restaurants, but there is something that will cater to everyone’s liking. There are even many vegetarian and vegan options scattered around the city. You might even come across some menu items that are a little out of the ordinary, like a pizza burger at The Thurman Cafe. Many families are attracted to the city because of its abundance of family-friendly attractions and activities. However, Columbus is a place where you can find something to do, no matter your interests. Here is a list of some of the most popular attractions. Columbus Zoo and Aquarium – This zoo and aquarium sits on over 500 acres of property. Take a journey through Asia, Africa, Australia, and North America as you learn about the different animals residing on these continents. COSI Columbus – This is an unique science museum and planetarium. The museum offers many hands-on labs and exhibits. Field of Corn – This may sound like an odd attraction, but in Dublin, Ohio, you will find over 100 concrete statues of corn positioned in a park. Many people enjoy going to the field to take fun pictures of the giant ears of corn. Motorcycle Hall of Fame – This small museum is home to memorabilia recognizing and honoring individuals that were a big part of the motorcycle sport. You will even see some cool bikes on display. National Dispatch is an auto transport company with a company-owned fleet. We offer competitive car transport rates, whether you are looking to ship your vehicle statewide or nationwide. With our experienced and knowledgeable staff, you can expect a hassle-free car shipping experience, from start to finish. We ship all types of cars across the United States, including classic, sport, and exotic models. Are you looking to get pricing information? Use our online quote form to get a free, instant car transport rate. No personal information is required. Only four simple fields (vehicle make, vehicle model, pickup location, and delivery location) are needed. You can also contact us at 800-321-2051 to speak with an auto transport representative.